Curtain Call is a Performance Talk Show in a busy public square. Erik Pold is the Talk Show Host, an Adventurer or a Scientist, who goes to explore the public space as a new unknown phenomenon. He looks into the theatre of reality, to discover the constructs behind a contemporary public space. The set up is a “fake” theatrical setting, where the audience is both displayed and “on display” to a public square in the middle of a commercial centre of a city. Curtain Call takes on the on-going debate within contemporary theatre of what is “real” and what is “fiction”, how much does “the stage” reflect reality and how much is “reality” a stage or a performance in itself. 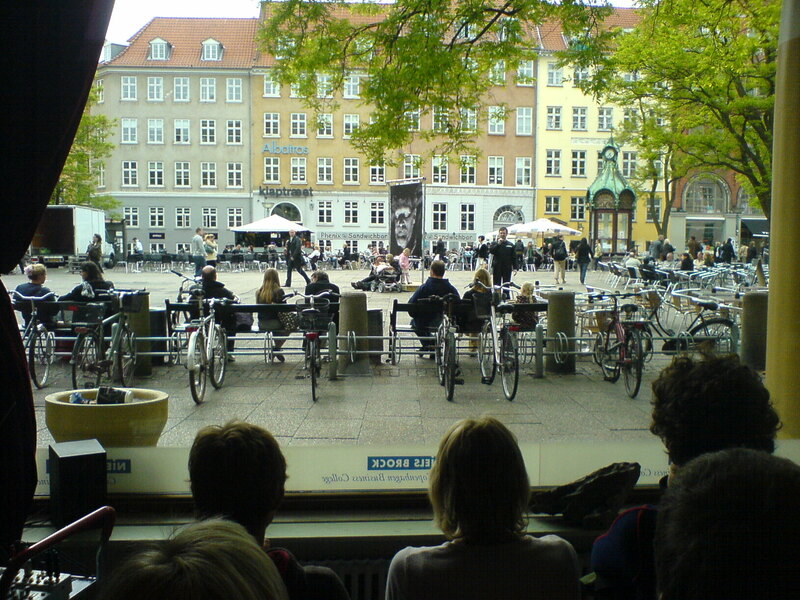 Audiences are seated on a tribune in a large display window, either the display of a shop or a café directly facing a square or pedestrian street/area. The large windows are covered with a theatrical curtain, to create a theatrical context. The performance starts in front of this curtain, and then moves out into the public space behind the window. Where the Talk Show involves the people who happen to be there. 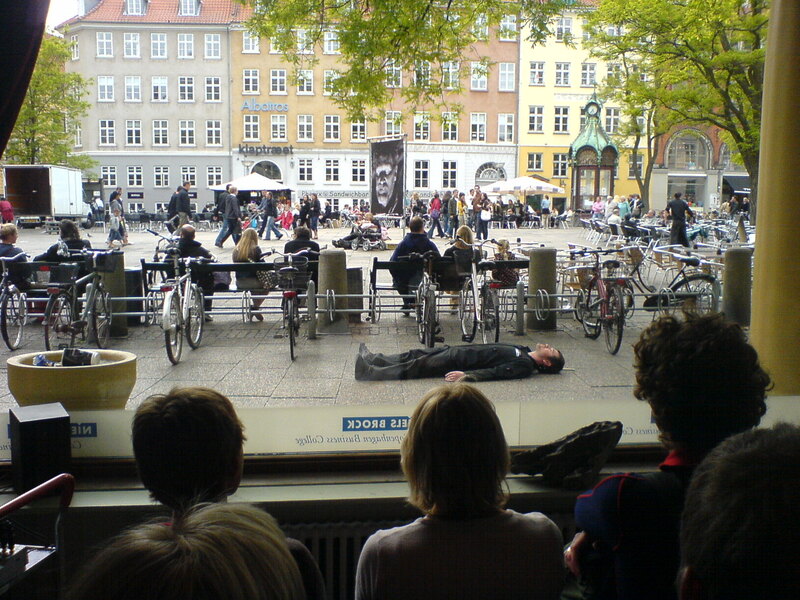 Audiences are visible to people on the square, like the audience can watch them through the window. So there is the question of who is really on display here. And in a surprising way the whole square turns into a stage. 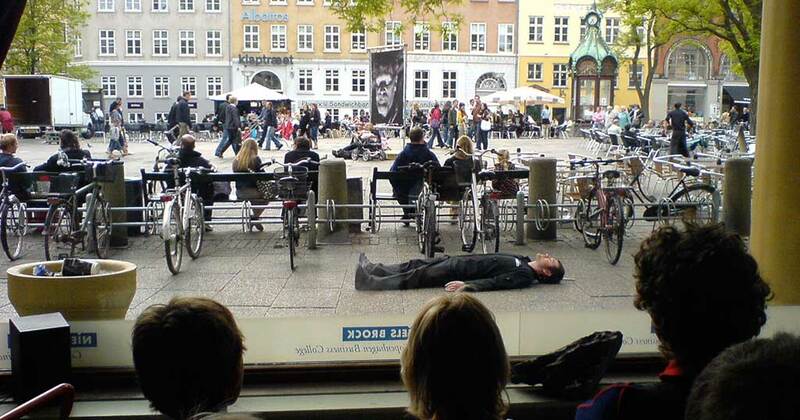 Erik Pold was asked to create site specific solo work in the public space of the commercial inner city of Copenhagen. The piece was made for the square in Copenhagen called “Kultorvet”. “The absolute highlight of Mellemrum 1 was a brilliant conceptual performance by dancer and choreographer Erik Pold, who welcomed the audience in a building at Kultorvet, one of Copenhagen’s busiest squares and pedestrian zones.